The location was perfect and gorgeous view from our patio and room had everything we could need and more. Owner was super sweet. very good location in a beautiful ally right next to a beautiful beach and a nice and cheep mini-market next to all the restaurants and cafes. 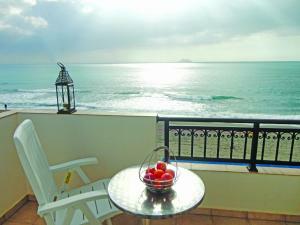 the room is very big with a fully equipped kitchen the beach is fully organized and is full beautiful colorful pebbles. Clean and good location, friendly owner, nice restaurants, cafes and bars 30m away (try that pizza place all the way to the end of the road). Regarding getting your keys and finding the owner, just stand in front of the main door and they'll come; They have cameras and will see you, they'll come downstairs. Mrs .Maria went out of her way to make us feel welcomed . The little ice cream cones to cool us off upon our arrived was super sweet . Great location. You can literally leave the property and be in the sea within a minute. Shops and restaurants nearby too. Friendly staff. Very friendly and welcoming family, beautiful and clean apartment with a nice kitchen. The house is next to the beach, perfect location if you want to be close to the sea. Just in front, you will find bars and restaurants on the beach. We only stayed 1 night, we would come anytime again. The Host was Really mice. She helped us a lot in different Things. Thema Room was Clean ans nice. I would recommend Studio Anessis. Maria, the owner of the place, is super-friendly and helpful! This is a very traditional part of Crete, so expect authenticity, not fake shiny arrangements like up in the north. This is of course not an international hotel, but a clean and friendly place run by local people who care. The location is amazing and it is good value for money. Lock in a great price for Studio Anessis – rated 8.3 by recent guests! 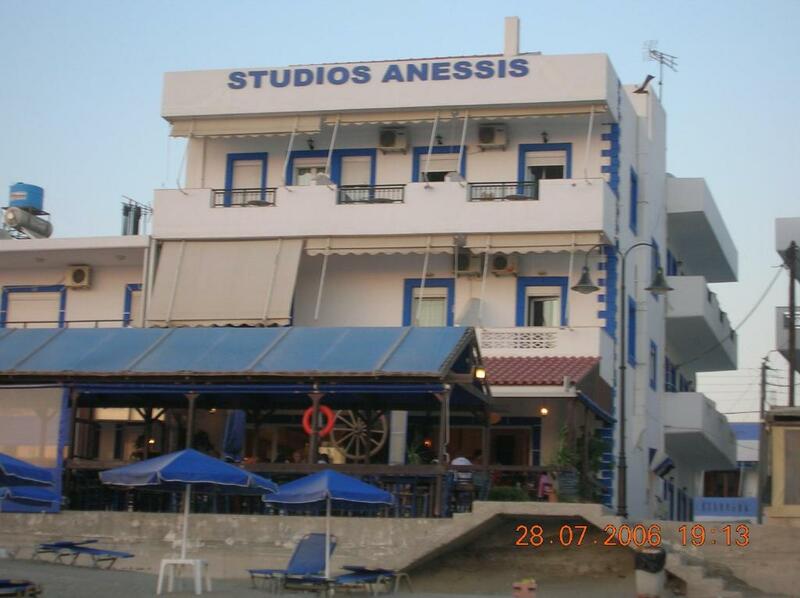 Studio Anessis is located in Kalamaki, just 30 feet from the beach. It offers self-catering accommodations with free WiFi access and private balconies overlooking the Libyan Sea. The air-conditioned studios and apartments come with a kitchenette with a refrigerator, cooking rings and kitchenware. Each unit also has its own bathroom with shower. 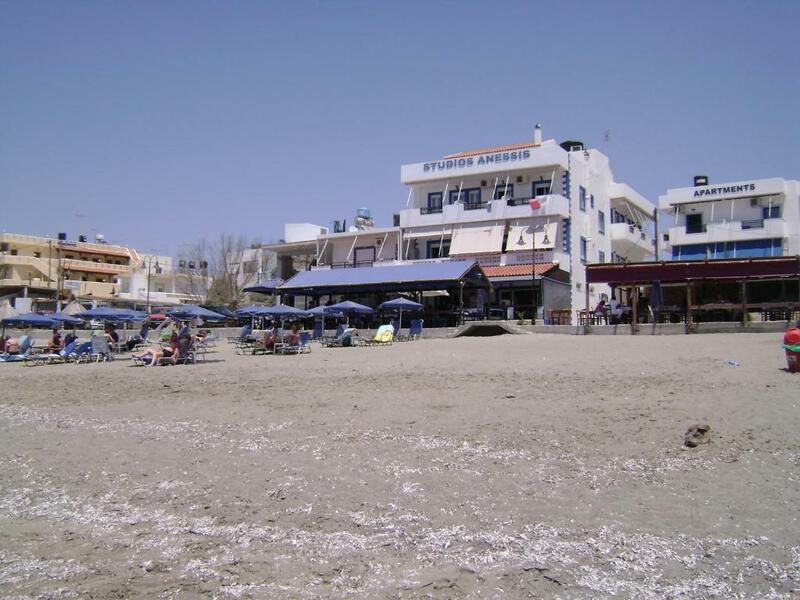 Within approximately 14 mi, you can visit the seaside village of Agia Galini. 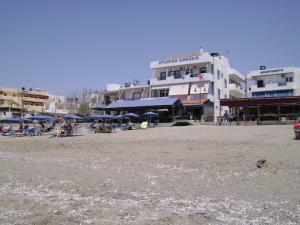 Nikos Kazantzakis International Airport is located 40 mi from the property. The property offers free parking. When would you like to stay at Studio Anessis? Air-conditioned studio with kitchenette, free WiFi and private balcony overlooking the Libyan Sea. Featuring a separate bedroom, this air-conditioned apartment comes with a kitchenette, free WiFi and private balcony overlooking the Libyan Sea. This studio has air conditioning, kitchenette and kitchenware. This family apartment is located on the ground floor and features a kitchenware, balcony and dining area. This triple room features a balcony, air conditioning and stovetop. Τα ενοικιαζόμενα διαμερίσματα Anessis βρίσκονται στην καρδιά του Καλαμακίου 40 μέτρα από τον αφρό της θάλασσας στο νοτιοδυτικό μέρος του νομού Ηρακλείου στην Κρήτη. Το Καλαμάκι είναι ένα τουριστικό θέρετρο με υπέροχη παραλία και ήρεμα καθαρά, γαλάζια νερά. Οικοδομημένα το 2002, τα διαμερίσματα Anessis αποτελούνται από 12 άνετα καλοσχεδιασμένα και ευρύχωρα studios και διαμερίσματα τα οποία είναι εξοπλισμένα για να προσφέρουν άνεση και ευρυχωρία. Τα studio Anessis είναι ανοιχτά για εσάς όλο τον χρόνο, όλα τα δωμάτια και τα διαμερίσματα μας στον 1ο και τον 2ο όροφο έχουν θέα στην θάλασσα, air condition, το δικό τους μπάνιο, πολυκούζινο, και δορυφορική τηλεόραση. Είναι διακομισμένα και επιπλωμένα σε μοντέρνο στυλ και είναι ιδανικά για οικογένειες και παρέες φίλων. Στο ισόγειο λειτουργεί το εστιατόριο Αριστείδης όπου μπορείτε να γευτείτε πλούσια και γευστικά πιάτα από την Κρητική κουζίνα! House Rules Studio Anessis takes special requests – add in the next step! Studio Anessis accepts these cards and reserves the right to temporarily hold an amount prior to arrival. Please inform Studio Anessis of your expected arrival time in advance. You can use the Special Requests box when booking, or contact the property directly using the contact details in your confirmation. The Booking description reads 'private balconies', so I expected seaviews and, erm, a balcony. Instead I got a dark ground floor apartment in the side street with a small patio at the back to sit outside. Not sure this is down to the property or to Booking, but I feel the description could be clearer. The fact that it's always preferred to pay in cash is sometimes annoying. Would rather pay by card. It would have been nice to have had a shower curtain. The bathroom was permanently flooded and we carried the water through the apartment. The kitchen is very basic but you go for meals there anyway. There was some confusion when checking out. I was under the impression that I had paid in full in order to secure the room for us. It seems that Booking.com does not release the funds to the proprietor until AFTER the stay. With the language barrier, it was a little disconcerting after such a lovely sojourn there. The apartment proximity to the beach is fantastic. The balcony is an amazing spot to watch the sunset. And our hostess Maria was so kind and sweet to us. room in not well ventilated. The bed mattress is very basic. all facilities are only very basically maintained. the decor is very old fashion. Every detail in the room is too old, it requires compelete renevation Room was smelling very bad sometime, towels were too bad. Internet connection would drop, cell signal was very low. The sea is nice but has slates in the shoreline, making it hard to enter, very slippery. Get reef shoes with you.